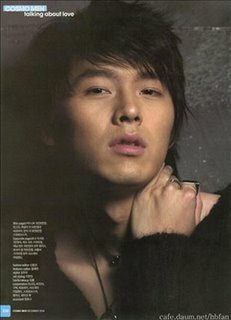 Hyun Bin has been dating Hwang Ji Hyun for almost a year. Reportedly, they broke up in the middle and then got back together again. Those who are wondering who Hwang Ji Hyun is, she was in New Nonstop 3 and recently, Come back Soon Ae as Park Jin Hee’s stewardess friend. doozy: As a crazy fan girl, my reaction is: Why?! Why her and not me?! As a realistic person with her head on straight, my reaction is: Why?! Why her and not me?! Haha. I’m kidding! Honestly, as long as he’s happy, I’m happy. Remember a while back I posted the news about Hyun Bin’s upcoming drama Queen of Snow? Recently, the production company announced who the leading actress would be. If you’re interested, read the news below for more details. The production company “Yoon’s Color” announces that Sung Yoo Ri (25) and Hyun Bin (24) will lead the drama Queen of Snow scheduled to be aired by KBS2 around Christmas. This drama attracts attention because the PD is Lee Hyung Min who produced and directed the popular drama I’m Sorry, I Love You and the script writers are the duo Kim Eun Hee and Yoon Eun Kyung who wrote for Winter Love Song. SYR plays the role Bo Ra who behaves arrogantly and cynically like an icy princess. She falls in love with her destined love Tae Woong (played by Hyun Bin) who lives in a third-class boxing gymnasium. The filming team just returned to Korea after the initial shooting in New Zealand. The PD Lee Hyung Min states, “Currently, the scenery in New Zealand is beautiful. I am amazed by Hyun Bin’s performance in his transformed role. I anticipate seeing what image SYR would present to TV viewers in this drama. I believe that it would be an unquestionably big surprise.” SYR’s previous drama was One Fine Day while HB’s was My Name is Kim Sam Soon. doozy: Like I’ve said before, I’ll watch this to support Hyun Bin. However, no comment on Sung Yoo Ri. Actor Hyun Bin has been casted to be the leading actor of the KBS 2TV drama series Noon Eui Yeo Wang (Queen of Snow)’ which is scheduled to air this coming November. Noon Eui Yeo Wang (Queen of Snow) is a sad fairy-tale like love story about a genius boxer fighting against a terminal disease and a daughter of a wealthy family that meet and fill each other’s hearts. 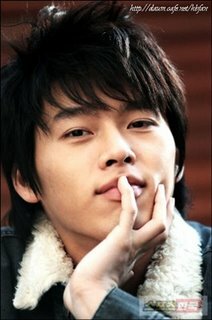 Hyun Bin has been casted for the role of the lead male character Han Tae Woong. Tae Woong used to be labeled a boxing genius, but is now a high school drop-out that works as a sparring partner at a third-class boxing gym. Lackluster and without a dream, he one day meets a woman and feels destined love. The drama has also gathered attention due to the participation of writers Kim Eun Hee and Yoon Eun Gyeong who were part of the team of Winter Sonata as well as the producer and director Lee Hyeong Min of I’m Sorry, I Love You. doozy: Hyun Bin filming a new drama?! Woot woot! No news yet of who the leading lady will be. Many fans are hoping for Hyun Bin to be paired with Song Hye Gyo in a drama, although it doesn’t necessarily have to be this one. Heck, there’s even an online petition for this coupling. However, I don’t think the chances of that happening are high for this drama as Song Hye Gyo is currently busy preparing for her movie. We’ll stay tune for news on the remaining cast members. Once again, the storyline revolves around a main character whose remaining days are numbered and is trying to achieve a goal, similar to I’m Sorry, I Love You. Although I did not like Winter Sonata and I’m Sorry, I love You (despite its many praises) and the storyline here seems to be unoriginal, I’ll watching anything that Hyun Bin stars in. He’s a good actor and makes for lovely eye candy! Samshiki, bbashya!